Long before I started work on The Haight, I fell in love with the neighborhood that would lend its name to the murder mystery. Haight-Ashbury has done a tremendous job of retaining the spirit that made it famous during the Summer of Love. The iconic bands have gone. The Trips Festival is a distant memory. But there is an enduring ambience to the place that makes it unique in the world. There are a handful of landmarks that are on every sightseer’s list – 710 Ashbury, the Red House, the Haight and Ashbury street signs. If you really want to immerse yourself in the lore of Haight-Ashbury, the best advice I can give is to take Stannous Flouride’s Haight-Ashbury Walking Tour. A keen student of history and culture, Stan is a fountain of information about the district. But here’s a list of a few of my favourite stopping places whenever I visit Haight-Ashbury. 1. The Drum Circle on Hippie Hill – Every Sunday afternoon since God was a little boy, the drum circle has been gathering at the foot of Hippie Hill. There’s nothing finer than lounging on the grass and witnessing the percussionists coming together to play. It’s not just the rhythms, grand as they are. It’s the fellowship, the diversity, the joyful camaraderie of a diverse group of musicians coming together to share what they love. 2. Zam Zam – Entering this bar is like stepping into a time warp, for little in its dim recesses has changed in decades. The original owner Bruno Mooshei died in 2000, but the current bartenders still serve the best martinis in the world. (Just ask them.) And the establishment has retained its unique character, with its Persian mural and vintage cash register behind the bar, and juke box against the back wall. 3. The Booksmith and The Bindery – Who doesn’t love to browse in bookstores? If you do, there’s one on either side of Haight Street between Clayton and Shrader. And they have the same owner. The Booksmith has been a Haight-Ashbury institution for eons, and in 2017 it opened a sister shop, The Bindery. The new shop features The Arcana Project, which retails fiction and non-fiction from all over the world. Check out their list of events. 4. 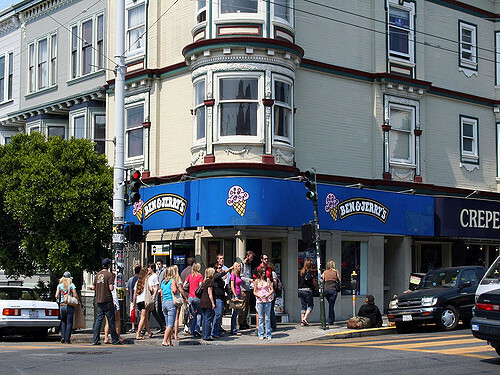 Eating Cherry Garcia Ice Cream on Jerry Garcia’s Street – Fine, I’m a victim of mass marketing. But I love to hang out on the corner of Haight and Ashbury and enjoy the ice cream named for the Dead’s guitarist just down the hill from the Dead’s old house. 5. Four Seasons Houses on Waller Street. People gush about the Painted Ladies on Alamo Square, but they pale in comparison to these four edifices on the corner of Masonic. These four homes are perfectly appointed and maintained, and each displays a painted medallion representing one of the seasons. You can enjoy a quiet intimacy with these buildings during a stroll down Waller in a way you never can with the Painted Ladies. 6. Coffee to the People – This Masonic Avenue establishment is everything a coffee shop should be. It’s family-owned, and celebrates its local community, from the stacks of fliers to the local art for sale on its walls. The staff is great, the food and drink wonderful. It’s the perfect place to take a break on your tour or spend a morning working on your laptop. 7. Magnolia Gastropub and Brewery – Nothing celebrates both Haight-Ashbury’s legacy and contemporary vitality like Magnolia at 1398 Haight Street. Magnolia Thunderpussy – the muse for the Grateful Dead song “Sugar Magnolia” – ran the Drugstore Café at this site in the 1960s. Hippies flooded the café in its heyday. “The Drugstore Café was always loaded . . . one way or another,” wrote Gene Anthony in his 1980 book The Summer of Love. (In my novel, The Haight, drug lord Andy Fox and his henchman Jethro enjoy a meal in the Drugstore Café.) Today, Magnolia offers a splendid array of craft beers (Try the Blue Bell Bitter) and the sort of rich menu you’d expect in a brew pub.